Home / Entertainment / THE SEARCH FOR AREWA OGUN BEGINS ON THE 1ST OF NOVEMBER 2015! WHO IS SHE? 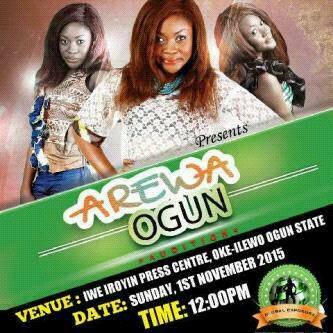 THE SEARCH FOR AREWA OGUN BEGINS ON THE 1ST OF NOVEMBER 2015! WHO IS SHE? Global Exposure Events and Parties Present Arewa Ogun 2015 Beauty Pageant, another history is about to the made, let's celebrate the Pride and Cultural Heritage of Ogun State. Venue; Iwe Iroyin Press Centre, Oke Ilewo, Abeokuta Ogun State. Prizes; Winner; 1 Week All Expenses paid to Dubai, 100,000, 1 year Wardrobe Allowances, 1 year Beauty Products. 1st Runner Up; A laptop, 50,000, 6 months Wardrobe Allowances. 2nd Runner Up; BlackBerry Z10, 25,000, 3 Months Beauty Products. All Contestants Will Go Home With Goodies Bags. Forms Available at; Citiside Fashion Outlet, Quarry Road Abeokuta. Hair Village and Spa Opposite VIO Office, Post Office, Abeokuta. Dresswyse Boutique, back of Mr Biggs, Ita Eko. Also available at all SUG building in all higher institutions in Ogun State. Applicants must be between ages 18 -24, must be a student of any higher institution in Ogun State or a Native of Ogun State in other Institutions Outside Ogun State. PROUDLY SUPPORTED BY SINGLELINK MAGAZINE INTL!